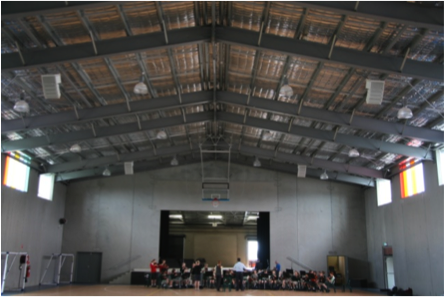 This school has a new gym made of tilt slab construction which presented a large space with very poor acoustics. Previous sound systems allowed the school to use the front half of the building only as the sound was incomprehensible in the back half of the room. Along with the line array speakers, the system was controlled with a matrix processor which allowed us to tune the speakers to the hall with our spectrum analyser. The processor also allowed one touch control to switch between a simple mixer and a more complex mixer. The simple/complex arrangement is a common feature of our school and church installations as it allows most every day users to use the system without having to understand how to operate a complex mixer, yet it allows the easy and quick use of a complex mixer when required and a trained operator is available. As part of this installation, we also supplied SM58 microphones, a 16 channel Mackie mixer, foldback speakers and amplifiers, a 50 mtr long microphone multi-core, mic stands and DI boxes. We also integrated the projection control system and audio.